Distinctive Insignia (DI), sometimes also known as Distinctive Unit Insignia (DUI), is a metal heraldic device worn by soldiers in the United States Army. The DI design is derived from the coat of arms authorized for a unit. DI’s may also be called a “crest” or a “unit crest” by soldiers or collectors. (The term “crest” may be misleading, as the device represents a coat of arms rather than a heraldic crest. The term crest properly refers to the portion of an achievement of arms which stands atop the helmet over the shield of arms.) The U.S. Army Institute of Heraldry is responsible for the design, development and authorization of all DI’s. The use of the regimental coat of arms or badge as approved by the War Department for wear on the collar of the white uniform and the lapels of the mess jacket was authorized on the 29th of April, 1920. A 1921 statement says: “It has been approved, in principle, that Regiments of the Regular Army and National Guard may wear distinctive badges or trimmings on their uniforms as a means of promoting esprit de corps and keeping alive historical traditions. Various organizations which carry colors or standards have generally submitted coats of arms having certain historical significance. As fast as approved these coats of arms will for the basis for regimental colors or standards which will eventually replace the present regimental colors or standards when these wear out. The use of these coats of arms as collar ornaments in lieu of the insignia of corps, departments, or arms of service would be an example of distinctive badge to be worn by the regiment.” The first unit to wear this insignia was the 51st Artillery which received approval for wear on March 18, 1922. It was designed by Master Gunner and Master Sergeant Edward C. Kuhn, the artist responsible for creating all authorized coats of arms and distinctive unit insignia at the time. A silver metal and enamel device 1 3/16 inches (3.02 cm) in height overall consisting of a shield blazoned: Azure, a fleur-de-lis Argent between two oak trees eradicated in fess Or; on a canton of the second (Argent) a boar’s head erased Sable (for the 30th Infantry) and for unofficial use pendant from the escutcheon a croix-de-guerre with Gilt Star Proper. Above the shield from a wreath of the colors (Argent and Azure) a falcon’s head erased Or, in the bill an ivy leaf Vert. Below the shield a Black scroll inscribed “D’une Vaillance Admirable” in Silver letters. The shield is blue for Infantry. The fleur-de-lis from the arms of Soissons and the two trees representing the Grove of Cresnes, the capture of which was the regiment’s first success, are used to show service in the Aisne-Marne campaign. The boar’s head on the canton is from the crest of the 30th Infantry and indicates that this regiment was organized with personnel from the 30th. The falcon’s head for Montfaucon in the Meuse-Argonne, holding in his bill an ivy leaf from the shoulder sleeve insignia of the 4th Division, to which the 39th was assigned during World War I. The motto is a quotation from the French citation awarding the Croix de Guerre with Gilt Star to the regiment for service in World War I. The distinctive unit insignia was approved on 31 January 1941. 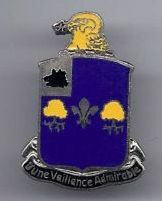 A gold color metal and enamel device 1 1/8 inches (2.86 cm) in height overall consisting of a shield blazoned: Argent, the shoulder sleeve insignia of the 4th Division, Vert; on a canton Azure an imperial Chinese five-toed dragon affronté Or scaled of the third (for the 9th Infantry). This Regiment was organized from the 9th Infantry in 1917, the parent organization being shown by the canton taken from its arms. Service of the 47th Regiment during World War 1 in France with the 4th Division is represented by the divisional insignia on the shield. The distinctive unit insignia was approved on 20 March 1936. 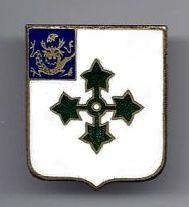 A silver color metal and enamel device 1 3/32 inches (2.78cm) in height overall consisting of a shield blazoned: Sable, a pale wavy Argent charged with a fusil Gules; on a canton embattled of the second a field gun of the third on a mount Vert. Attached below the shield a silver scroll inscribed “To the Utmost Extent of Our Power” in black letters. This regiment was organized in June 1917 from the 7th Infantry and participated in the World War in the 5th Division, the insignia of which is carried on the shield. Black, white and red show engagements against Germany and the wavy pale is for the Meuse River, the crossing of which near Dun in November 1918 was the outstanding operation of the regiment. The crest and motto symbolized the spirit of the regiment during the Meuse crossing and are guides for the future conduct of the organization. The coat of arms was approved on 7 Jan 1921. A gold color metal and enamel device 1 1/8 inches (2.86 cm) in height overall consisting of a shield blazoned: Gules, in front of a horseshoe Proper, a 75mm projectile Or. Attached below the shield a red scroll inscribed “Courage and Action” in gold letters. The shield is red for Artillery. The horseshoe and the projectile suggest the character of the Regiment. 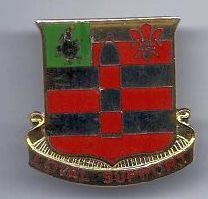 The distinctive unit insignia was originally approved for the 26th Field Artillery Regiment on 21 October 1938. It was amended to revise the description on 22 March 1939. The insignia was re-designated for the 26th Field Artillery Battalion on 30 November 1940. A gold color metal and enamel device 1 1/8 inches (2.86 cm) in height overall, consisting of a shield blazoned: Gules, in front of a truck wheel Or a 155 mm howitzer projectile of the first, that part on the field fimbriated of the second. 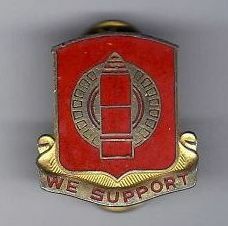 Attached below the shield, a gold scroll doubled back and inscribed “We Support” in red letters. The red shield and its charges indicate the character of the Regiment. 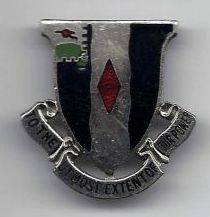 The distinctive unit insignia was originally approved for the 34th Field Artillery Regiment on 16 June 1938. It was re-designated for the 34th Field Artillery Battalion on 21 December 1940. *At this moment I am missing the description, symbolism and background for this Distinctive Insignia. I will update this as soon as I have this information. A gold color metal and enamel device 1 1/16 inches (2.70 cm) in height overall consisting of a shield blazoned: Gules, on a saltire Or a winged spur of the first. 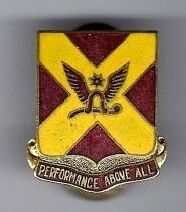 Attached below the shield a red scroll inscribed “Performance above all” in gold letters. The shield is red for Artillery. The saltire is taken from the State flag of Alabama, the birthplace of the Regiment. The winged spur signifies that the unit was mounted. 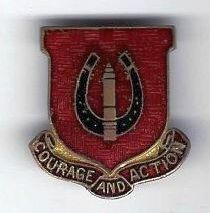 The distinctive unit insignia was originally approved for the 84th Field Artillery Regiment on 3 December 1936. It was re-designated for the 84th Field Artillery Battalion on 12 November 1940. A gold color metal and enamel disc. On a white background an orange lightning flash issuing from dexter surmounted by an orange winged foot. The orange and white are the colors traditionally associated with the Signal Corps. The lightning and winged foot, the badge of the former 9th Signal Company, refer to swift communications service, the function of the unit. The distinctive unit insignia was originally approved for the 9th Signal Company on 29th October 1942. 15th Combat Engineer DUI version 2 – Theater Made. 15th Combat Engineer DUI version 3 – Theater Made. A scarlet and white enamel shield, the primary colors of the US Army Corps of Engineers. Theater made versions have the motto “Drive on” and an oak leaf on a rock attached to the shield. The shield is divided per bend, scarlet and white, the traditional colors of the Corps of Engineers. The crest consists of a rock taken from the coat of arms of St. Mihiel, while the oak leaf represents service at Meuse-Argonne during World War I. 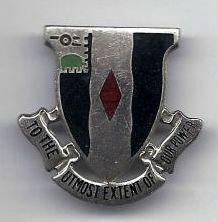 The distinctive unit insignia was originally approved for the 15th Combat Engineers in May 1942. Other DIs: 9th Medical Battalion, 9th Reconnaissance Troop, 9th Quartermaster Company and the 9th Military Police. More info on these will be added soon. More info and DIs will be added here in the future!